Jared Unzipped: St. Louis... Finally! Well, I've finally arrived in St. Louis. This is a place I've wanted to come for nearly all of my life. Today's leg of the journey was busy, but fun. 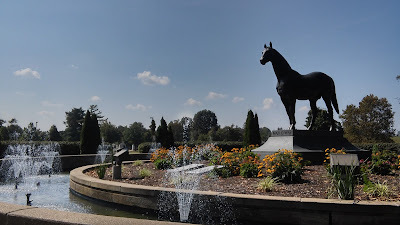 This morning, Crystal and I visited the Kentucky Horse Park in Lexington, Kentucky. It was absolutely gorgeous. The horses kept there (there are many different breeds) are very happy and healthy. We road a horse-drawn trolley, then met four champion horses in retirement. After leaving the park, we visited the Wild Turkey distillery. That was mind-blowing! It's quite nice knowing where Wild Turkey is produced. Their facility is clean and state-of-the-art, but still uses some of its old fashioned ways. One of the storage houses used for aging the bourbon was built in 1890. The inside smelled amazing! Our drive through southern Indiana and Illinois was quite boring. The landscape is comprised of rolling hills and farmland. Not many towns to see, nor anywhere to stop. If not for the large storm I drove through, it would have been a total snooze fest! We made it to our hotel safely, thankfully. I'm ready for a full night of rest and relaxation. Tomorrow, we go and watch a Cardinals baseball game. Woohoo!